Throughout the month of September I am working on getting my home and routines in shape and would love it if you'd join in. It's always so much more fun with friends. Here's the game plan and a guide to make it easier to find what you are looking for throughout the month. And because this isn't just for me, I've left week 4 open for whatever activities and additional things you want to accomplish! This guide will be added to as the month goes on, please give me your input on any topics you may want covered. 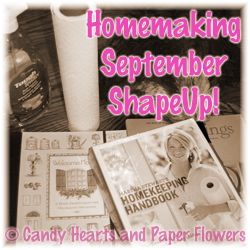 Join in the Homemaking September ShapeUp! What a great organizational idea! I didn't want to sort through to find the posts, and I figured... it's my blog, if I don't want to sort through it, no one else will. This should make it easier!